What are they and why should we care? Mast cells are known to cause severe allergies, unexplained or difficult to treat symptoms affecting numerous parts of the body. This brief overview looks at mast cells as currently understood: What are they? Why are they important? View "Mast Cells — Visual Perspectives"
Mast cells play an important protective role and have been observed as being intimately involved in wound healing and defense against pathogens. Mast cells are located in connective tissue, including the skin, the linings of the stomach and intestine, and other sites. They play an important role in helping defend these tissues from disease. By releasing chemical "alarms" such as histamine, mast cells attract other key players of the immune defense system to areas of the body where they are needed. Mast cells seem to have other roles as well. Because they gather together around wounds, mast cells may play a part in wound healing. For example, the typical itching felt around a healing scab may be caused by histamine released by mast cells. Researchers also think mast cells may have a role in the growth of blood vessels (angiogenesis). No one with too few or no mast cells has been found, which indicates to some scientists we may not be able to survive with too few mast cells. Mast cells have traditionally been viewed as effector cells of allergic reactions that can store and synthesize anew many mediators upon activation by a variety of stimuli. Exciting new insights are unveiling mast cell involvement in the pathogenesis of connective tissue disorders including wound healing and fibrosis. Therapeutic local manipulation of mast cell population and reactivity may help improve and even prevent impaired repair processes for which there is no cure. 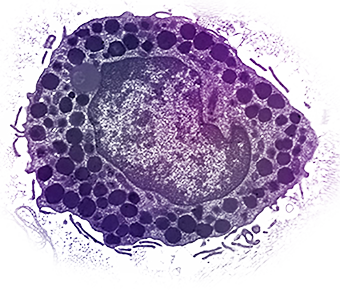 With continuing research into mast cells, new insights are being developed and the list of conditions, disorders and diseases that include mast cell involvement is growing. Below are just a few of the disorder categories where mast cells are involved. As described by The Mastocytosis Society, there are two main forms of mast cell disorders: Mastocytosis, where the body produces too many mast cells, and Mast Cell Activation Syndrome (MCAS), where even the normal number of mast cells are too easily activated by a trigger to release their contents, called mediators. These mediators can cause a variety of unpredictable symptoms in both children and adults, including skin rashes, flushing, abdominal pain, bloating, nausea, vomiting, headache, bone pain and skeletal lesions, and anaphylaxis. Triggers can be heat, cold, stress (physical or emotional), perfumes or odors, medications, insect stings, and foods. These symptoms are treated with medications including antihistamines, mast cell stabilizers, and leukotriene inhibitors, while anaphylaxis is a medical emergency requiring epinephrine. Mastocytosis can affect skin and internal organs such as the bone marrow, gastrointestinal tract, liver, and spleen. Most patients with mastocytosis have cutaneous (skin) or indolent (benign) systemic forms, but aggressive disease can occur, which may require chemotherapy. Many forms of cutaneous and mucosal allergy are mediated for a large part by mast cells; they play a central role in asthma, eczema, itch (from various causes) and allergic rhinitis and allergic conjunctivitis. Antihistamine drugs act by blocking the action of histamine on nerve endings. Cromoglicate-based drugs (sodium cromoglicate, nedocromil) block a calcium channel essential for mast cell degranulation, stabilizing the cell and preventing release of histamine and related mediators. Leukotriene antagonists (such as montelukast and zafirlukast) block the action of leukotriene mediators, and are being used increasingly in allergic diseases. In anaphylaxis (a severe systemic reaction to allergens, such as nuts, bee stings or drugs), body-wide degranulation of mast cells leads to vasodilation and, if severe, symptoms of life-threatening shock. Mast cells are implicated in the pathology associated with the autoimmune disorders rheumatoid arthritis, bullous pemphigoid, and multiple sclerosis. They have been shown to be involved in the recruitment of inflammatory cells to the joints (e.g. rheumatoid arthritis) and skin (e.g. bullous pemphigoid) and this activity is dependent on antibodies and complement components. Mast cells play a major role in many physiologic processes, but for reasons that are unclear, they may become an aggressive force, which can damage the natural biologic balance. One of the most significant challenges is early recognition of mast cell involvement in conditions and diseases which may present with a multitude of symptoms that are often misdiagnosed. Although appropriate referral to a specialist is essential, the limited arsenal presently available for identification and diagnosis is a considerable obstacle. More research is needed. Originally aired November 3rd, 2015, watch this video of Dr. Francis Collins, Director of Nation Institute of Health (NIH), speaking with Charlie Rose on relevant topics such as their new Brain Initiative and the process of research grant funding. Please consider donating to your preferred cause in the name of research.